Elmukulele has teamed up with Joey at Essentially Me to create something special this Easter Holidays to help keep your children entertained and inspired! This workshop will give Children the chance to create their own customized scent and song! Back by popular demand we are running another UKULELES AND MINDFULNESS at Work-shop Brisbane for all those wanting the use the Ukulele as a tool de-stress and forget about the troubles of the day. Hurry as there are limited spots available. We are so EXCITED to announce our next Childrens workshop will be hosted in collaboration with Downtown Music Studios. There will be two seperate age groups, 8-12 and 13-16 to cater to the needs (and musical interests) of the 2 demographics. A great chance to give your child the opportunity to socialise, learn how to play in a a group, hand coordination/fine motor skills, sing and play at the same time and learn some well known songs to continue at home. It's a great size instrument for smaller hands and can be a gateway to the guitar, violin and even mandolin!! Super excited to team up with Sustainable Surf Collab in Cooloongatta to present a workshop for those wanting to chill out and learn Ukulele on the southern end of the Gold Coast! Mindfulness...somewhat of a buzz word for 2017, but also a great way to be present, enjoy the moment and totally get lost in the music when it comes to Ukuleles! This workshop was focused on building skills and technique to work into playing music on the Ukulele and boy did we have fun! In the short time frame of two hours we covered basic chords, 4 different finger picking styles and a fantastic way to break down well known songs into creative playing. Sometimes it's hard to get past the old 'strum and play' when learning the Uke (which don't get me is great fun! ), but can become a bit tedious when playing the same way with EVERY song. Let's face it, dynamics just make everything better, and even though my lucky 15 victims might have been brain fried with all their newfound skills, they definitely wouldn't have been able to focus on anything other than the music. All in all, it was a really fun night seeing fresh faces once again at Work-shop Brisbane! Dec 2017, I teamed up with the lovely folk at Work-Shop Brisbane to produce a yummy Christmas themed ukulele workshop for those closet players ready to embark on their musical quests. It was a great turnout (although I forgot to take pictures with actual people in them) and fabulous to see such a diverse mix of people coming together to learn such a fun and simple instrument. Ukulele really is for everyone, whether it be someone picking up music for the first time, or a seasoned musician ready to have a little fun on a new instrument. The finger picking section of the workshop was one of the most popular activities and one I was very impressed by everyone picking (excuse the pun) up very quickly. I'm very excited to announce I'll be doing another 2 workshops with Work-Shop Bris (in a new an exciting location) January (10th) and February. January is going to be focusing on mindfulness and Ukulele, a fun way to switch off from the stress that may arise in the year ahead, and February is going to be themed with Beatles songs! 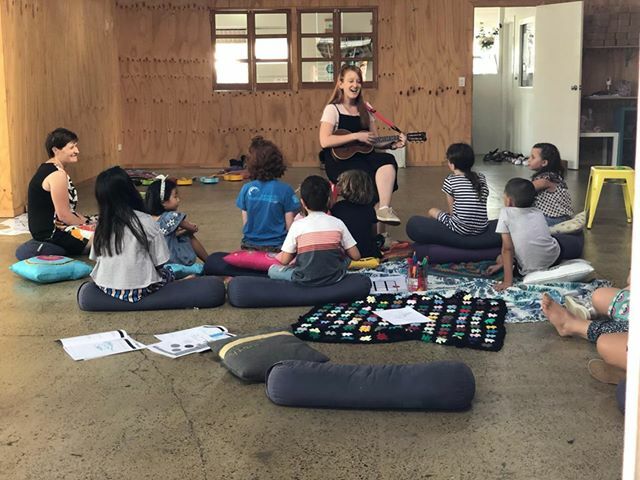 I had the pleasure of working with Jodie Yamanda from Jodies Healing Heaven in a joint, collaborative 'mindfulness and ukulele' workshop for teenage and tween girls. We created a unique and interactive experience for the young ladies to inspire and empower themselves via meditation and music. They were given powerful tools in way of coping with stress, finding their inner voice and letting go of all the everyday worries delving into basic ukulele and singing techniques. It was wonderful to see their progress after only 3 hours in the workshop, as they went from shy and timid, to confident and working as a team to create beautiful music (as well as some well known tunes they could impress their family and friends with).